Lowsalt Presents: OVERLOOK: Next to a carpark, beside the railway lines, overgrown and overlooked. Using the container as a base and viewing platform, Will Foster introduces you to this patch of urban wasteland. Visitors are invited to investigate its particularities, ecology, users, and future potential. www.willfoster.co.uk REPLAY-LOWSALT: A mini-retrospective. Lowsalt will present documentation of memorable exhibitions, events, and productions as well as artifacts plucked from our 2006-08 archives. A chance for reflection and discussion with new audiences and past collaborators. 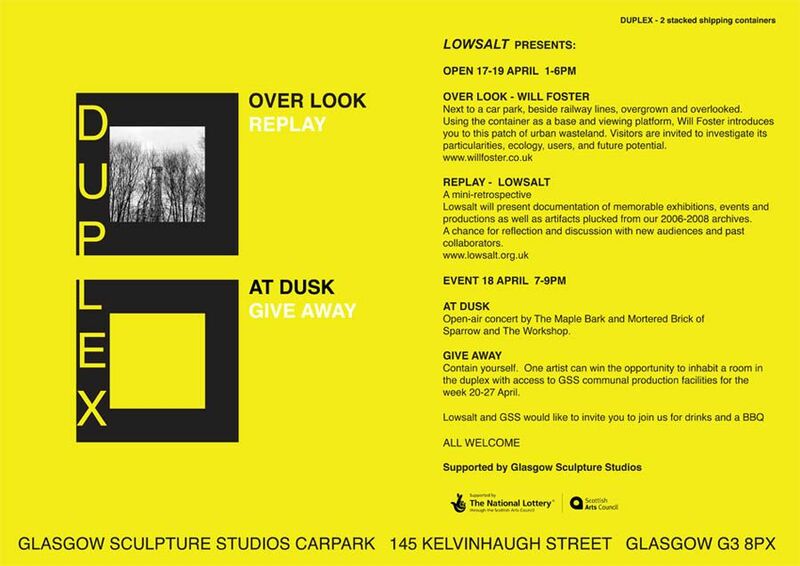 EVENT April 18th 7-9pm Lowsalt and Glasgow Sculpture Studios invite you for drinks and BBQ in the GSS carpark... including... AT DUSK: An open air concert by The Maple Bark and Mortered Brick of Sparrow and The Workshop. GIVEAWAY: Contain Yourself. One artist can win the opportunity to inhabit a room in the duplex with access to GSS communal production facilities for the week 20- 27 April.